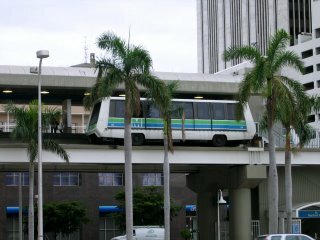 Though in my opinion the Miami public transit system is just incredibly sub-par for a city this size, it does have a small crowning gem, the Miami Metromover, an automated, elevated train system that services the entire Downtown area. I hadn't been Downtown in about a year, and was very surprised to find out that the Metromover is now a free service, which makes a great service even better. I went for a ride to get to some of the spots I have shown you in the past week, and even recorded a short movie of the trip between two of the stations (from College North to College/Bayside stations, on the inner orange loop if you look at the map). to me, it's cute ! How cute! Add on six more cars, a thousand more people, chop down the palm trees and it's Washington, DC!! But no, I like the Miami version much better. And I love palm trees!